Comments: Thomas Ellison Bruce, Sr., owner of Bruce's Drug Store in Scottsville, was a popular and successful community leader. He served four terms as Mayor of Scottsville (1935-1943) and played an important role in attracting new business to an economically disadvantaged community with a declining population. When more rayon cord was needed for military tires during World War II, the U.S. Rubber Company began a search for a new factory site. Ellison and several Town Council members met with U.S. Defense members at Bruce's Drug Store to point out the many advantages of locating the new plant along the James River next to the C&O rail line. They also highlighted the availability of conscientious local workers to populate the plant's work force and strong community interest in the project. Ellison persuaded the local landowner to sell the desired acreage to the government, and construction of the plant began in 1944. This textile mill was operated by U.S. Rubber as a defense plant until 1946 when they purchased it from the government. Soon the plant payroll was injecting $700,000 annually into the local economy and, within 8 years, the town's population had doubled. 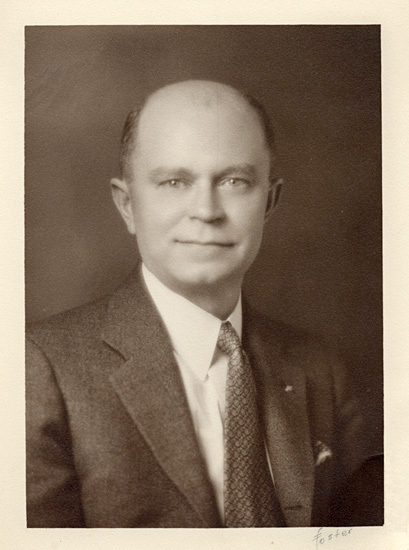 In 1943, Albemarle County voters elected Ellison to the first of two terms he served on the Albemarle County Board of Supervisors from Scottsville District. Ellison was stricken by a heart attack during his second term and died unexpectedly on November 25, 1947, in Scottsville. This photo of Thomas Ellison Bruce, Sr., is part of the Anne Shirley Dorrier collection. Anne Shirley resides in Scottsville, Virginia, and is the daughter of Thomas Ellison Bruce, Sr., and Mary (Browne) Bruce.